...st spoken to Moses. There the Lord speaks to the people the Ten Commandments and enters into covenant with Israel. That takes place in Exodus 19. Let’s take a look. ... true believers will not fall. 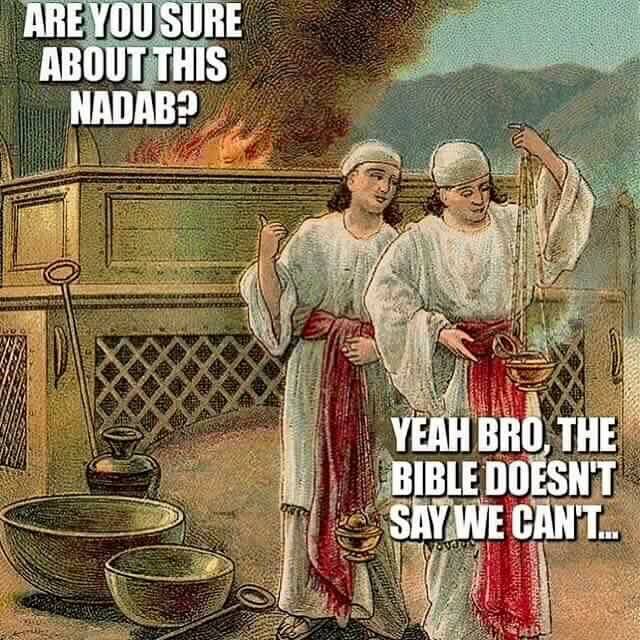 A general word about Hebrews is in order here. Christ does much more than we ask. Just as He prayed for Peter (Luke 22:31-32), so likewise He prays for the faith of His elect. In short, Christ prays that the fruits of His death may be applied to all His people. ...ered unauthorized fire before the LORD, which he had not commanded them. 2 And fire came out from before the LORD and consumed them, and they died before the LORD. 3 Then Moses said to Aaron, “This is what the LORD has said: ‘Among those who are near me I will be sanctified, and before all the people I will be glorified.’” And Aaron held his peace. Lev. 9:24 And fire came out from before the LORD and consumed the burnt offering and the pieces of fat on the altar, and when all the people saw it, they shouted and fell on their faces. which he commanded not; yea, forbid, by sending fire from heaven, and ordering coals of fire for the incense to be taken off of the altar of burnt offering; and this, as Aben Ezra observes, they did of their own mind, and not by order. It does not appear that they had any command to offer incense at all at present, this belonged to Aaron, and not to them as yet; but without any instruction and direction they rushed into the holy place with their censers, and offered incense, even both of them, when only one Priest was to offer at a time, when it was to be offered, and this they also did with strange fire. This may be an emblem of dissembled love, when a man performs religious duties, prays to God, or praises him without any cordial affection to him, or obeys commands not from love, but selfish views; or of an ignorant, false, and misguided zeal, a zeal not according to knowledge, superstitious and hypocritical; or of false and strange doctrines, such as are not of God, nor agree with the voice of Christ, and are foreign to the Scriptures; or of human ordinances, and the inventions of men, and of everything that man brings of his own, in order to obtain eternal life and salvation. ...e had passed over former sins. Heb 13:11-12 For the bodies of those animals whose blood is brought into the holy places by the high Priest as a sacrifice for sin are burned outside the camp. 12 So Jesus also suffered outside the gate in order to sanctify the people through his own blood. 1Pet 2:24 He himself bore our sins in his body on the tree, that we might die to sin and live to righteousness. By his wounds you have been healed. 1Pet 3:18-20 For Christ also suffered once for sins, the righteous for the unrighteous, that he might bring us to God, being put to death in the flesh but made alive in the spirit, 19 in which he went and proclaimed to the spirits in prison, 20 because they formerly did not obey, when God's patience waited in the days of Noah, while the ark was being prepared, in which a few, that is, eight persons, were brought safely through water. 1Jn 2:1-2 My little children, I am writing these things to you so that you may not sin. But if anyone does sin, we have an advocate with the Father, Jesus Christ the righteous. 2 He is the propitiation for our sins, and not for ours only but also for the sins of the whole world. Jn 3:16 For God so loved the world, that he gave his only Son, that whoever believes in him should not perish but have eternal life. Matt. 12:3-4 He said to them, “Have you not read what David did when he was hungry, and those who were with him: 4 how he entered the house of God and ate the bread of the Presence, which it was not lawful for him to eat nor for those who were with him, but only for the Priests? Jesus raises this example without the slightest idea that David was in the wrong or that he committed sin in eating what was forbidden in the Law of Moses to any other than the sons of Aaron (Ex. 29:32-33; Lev. 8:31). This is an example where the breaking of a particular law, in this case ceremonial and one which was pointing to Christ as the Bread from Heaven (John 6:41) Who is always at the presence of God on our behalf, was not sinful. But what if, for example, to get that bread David would first had to kill the Priests? Would the Lord Jesus not find blood on David’s hand and exonerate him because he was hungry? Such a suggestion is absurd and would never have come to the Lord’s mind. We see here a distinction between the moral and ceremonial law. To break the ceremonial law was not the same as breaking the moral law. If David had broken the moral law he would not have been exonerated like he was for breaking the ceremonial law. I believe that I have so far argued a case (which for me is convincing) of a threefold division of the law. I have tried to show that the law was certainly not understood as an indivisible, moral whole by the biblical authors. My last survey will be with the Apostle Paul. We will look at a few things from the Apostle which show us that he did not understand the law as an indivisible whole, but rather distinguished certain things. I will try to be brief. ...ere for the present purpose, namely: who are the members of the New Covenant. 1. Christ is said to obtain a ministry much more excellent and better than the ministry of the old Mosaic Covenant. The reason for this is twofold: 1) the covenant He mediates is better, and 2) the covenant is enacted on better promises. With the establishment of the New Covenant in Christ’s blood, the Mosaic Covenant is being called “old” and is “ready to vanish away” (v. 13). This ministry which He has received takes place in heaven, in the true Temple of God, not in the type on the earth, but in the anti-type in heaven (Heb. 8:1-2). The ministry of the Priests in the Temple in Jerusalem points to the ministry of the true and faithful High Priest in Heaven. The reason that this ministry is better is based on the fact that the covenant, on which this ministry is based, is better. The Mosaic and the New are not the same, but the one is better than the other. Moreover, the Lord Jesus is explicitly named to be Mediator only of the New Covenant (Heb. 8:6; 9:15; 12:24). Some Presbyterians suppose that the Lord Jesus was a mediator for the previous covenants also since all the previous covenants were essentially the same as the New Covenant, only different in outward form. But this is wrong. Clearly, in the words “the covenants he mediates is better” is implied that He did not mediate for the old covenant. We will come back later on the mediation of Christ in the New Covenant. ... mediator between men and God. A mediator is “one that mediates, especially one that reconciles differences between disputants.” Through Christ we have been reconciled to God (Col 1:21-22) and He is standing before the Father, as the Son interceding for us (Rom 8:26, 34; Heb 7:25), He is interceding for a specific people, not every single individual in the world. This also brings the picture of Christ as High Priest, as seen in the book of Hebrews, He is the one pleading for His sheep to the Father. Let’s see what the Word of God says of the Lord’s intercessory work. For whom does Christ intercede? Heb 7:23-27 The former Priests were many in number, because they were prevented by death from continuing in office, 24 but he holds his Priesthood permanently, because he continues forever. 25 Consequently, he is able to save to the uttermost those who draw near to God through him, since he always lives to make intercession for them. 26 For it was indeed fitting that we should have such a high Priest, holy, innocent, unstained, separated from sinners, and exalted above the heavens. 27 He has no need, like those high Priests, to offer sacrifices daily, first for his own sins and then for those of the people, since he did this once for all when he offered up himself. Heb 9:24-28 For Christ has entered, not into holy places made with hands, which are copies of the true things, but into heaven itself, now to appear in the presence of God on our behalf. 25 Nor was it to offer himself repeatedly, as the high Priest enters the holy places every year with blood not his own, 26 for then he would have had to suffer repeatedly since the foundation of the world. But as it is, he has appeared once for all at the end of the ages to put away sin by the sacrifice of himself. 27 And just as it is appointed for man to die once, and after that comes judgment, 28 so Christ, having been offered once to bear the sins of many, will appear a second time, not to deal with sin but to save those who are eagerly waiting for him. In the book of Hebrews we see Christ’s High Priestly work. We see also that Christ intercessory work is rooted in His cross-work. He saves to the uttermost those who draw near to God, but then the question arises: Who draws near to God? The answer from Jesus’ lips is recorded in John 6:44 – No one can come to me unless the Father who sent me draws him. And I will raise him up on the last day. And on their behalf does He make His intercessory work. Imagine the Risen Lord of Glory interceding for someone for whom He did not died and for a one whom the Father had no chosen, He would fail miserably, but it’s impossible for the Lord of Glory to be rejected by the Father or for God to fail.